A great new place to eat vegan near Newcastle upon Tyne is the Duke Of Wellington Pub. Only 5 minutes from the city center this pub has a good selection of vegan starters, mains and desserts. We ordered fish and chips (one of the best we have had) and chocolate cake. Carrots, parsnips & onions caramelised in a sweet maple style syrup, flavoured with spices. Served with sliced bloomer bread. Skewered courgette slices hand wrapped around a Moroccan-influenced mix made with brown rice and vegetables, flavoured with coriander and cumin seeds. Served with tomato salsa and dressed salad leaves. A mildly spiced tomato curry served with rice and poppadoms. 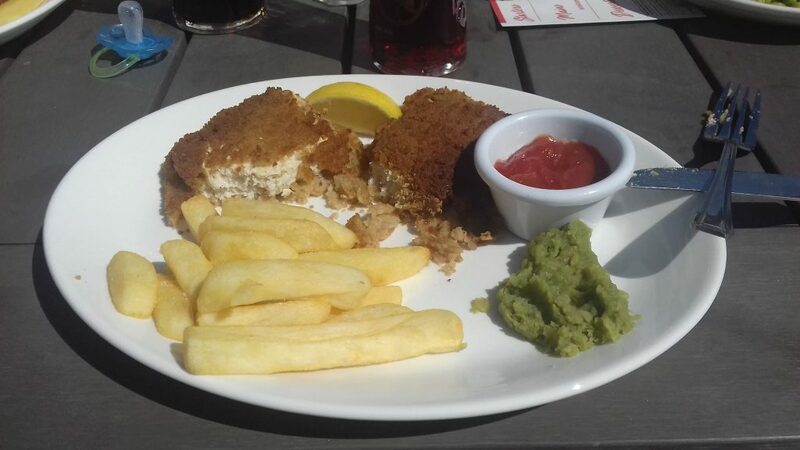 Succulent fish-free fillets in golden breadcrumbs with oven-baked chips, peas or mushy peas and tomato salsa. Mixed salad leaves tossed with toasted cracked greenwheat with celery, chickpeas, spring onions and sultanas in a lemon dressing with parsley, mint, garlic and a hint of cumin. 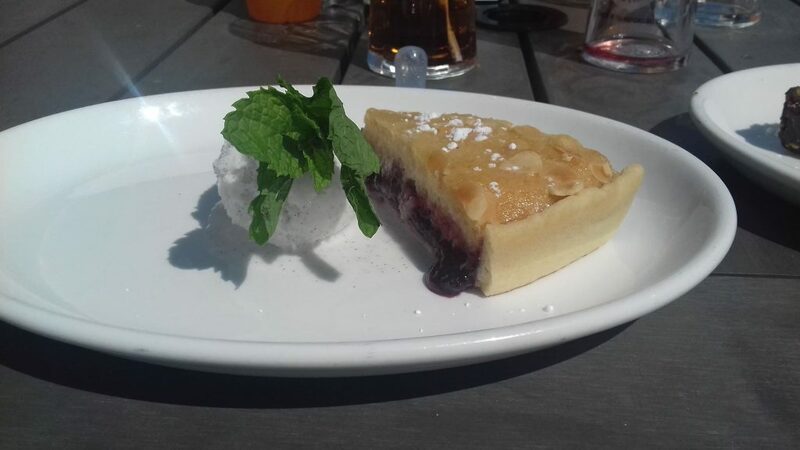 A pastry base filled with an indulgent boozy cherry compote, topped with a light almond frangipane and finished with toasted flaked almonds, served with coconut ice cream. 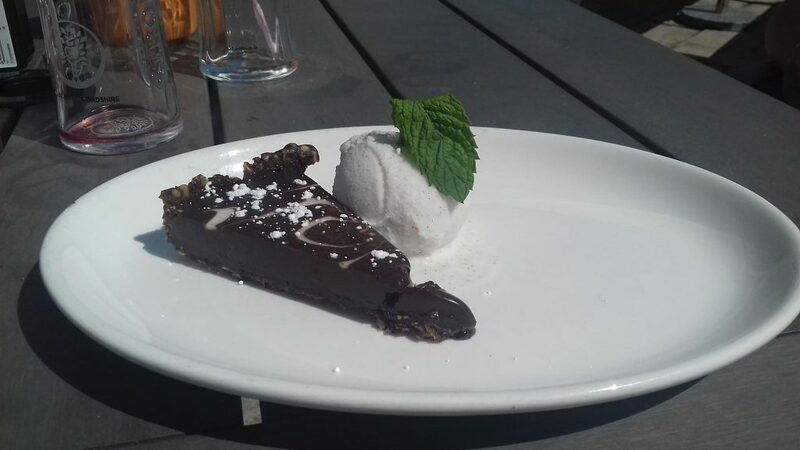 A date and nut base topped with Belgian chocolate & coconut milk torte, served with coconut ice cream. Served with coconut ice cream. While on our first leg of promotion / marketing for our upcoming fifth installment of Newcastle Vegan Festival, I stumbled across a vegan stall within the Dundas Market in Middlesbrough. 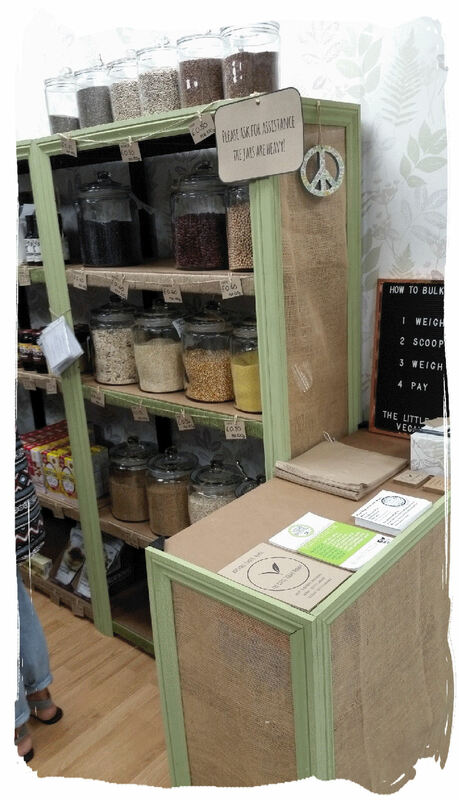 The Little Vegan Market had a good selection vegan foods and products, but to my surprise I found it at only been open several days, it only opened on Tuesday 5th June 2018 in fact (4 days before my visit). I talked to the owners and they, as I was taken aback by how much interest in veganism there was in the area, while taking some photographs around 10am the well stocked store was packed with what seemed to be very informed and passionate vegans, I waited for 10-15 mins for the customers to leave so I could take a photo of the stall without anyone there, but more and more people seemed to be arriving, so I gave in and took the photo as I needed to be elsewhere. 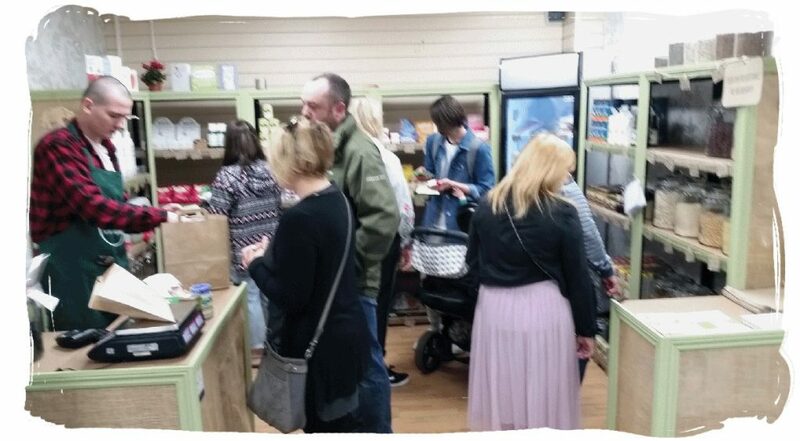 This is another example of how veganism in the UK, is exploding and the growth of vegan business in the north east is booming. Lets hope we see more and more of this type of thing in the future.. 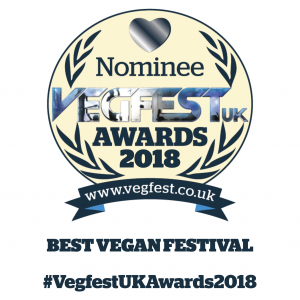 REMEMBER : Every penny we spend is a vote, so vote for a more healthier, ethical and environmentally sustainable future, vote vegan…. We recently visited pulp fiction future food in Whitley Bay, although I have visited this restaurant before the menu had changed and last time I forgot to take pictures for a blog post so thought I would make the effort to come back and get more more pictures of their amazing food. I visited with my family so we managed to try out a few different options. 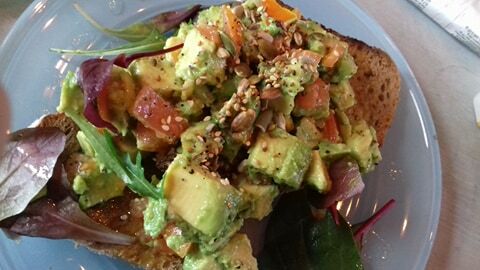 We ordered the Avocado on toast which was on a sourdough bread, this tasted lovely, I also ordered the mixed berry smoothies which had raspberries, blueberries and strawberries with soya yoghurt in it, I think there is normally honey added to it but I asked them to make it vegan. The other drinks we ordered was just a English breakfast tea and a hot water. 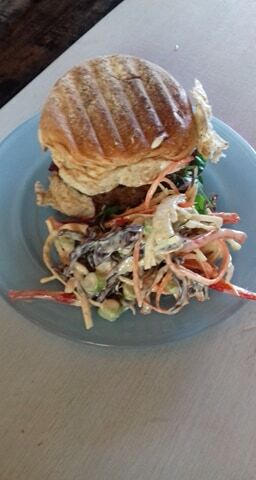 The other foods were the Moroccan carrot and red lentil burger which came with vegan coleslaw which tasted amazing. 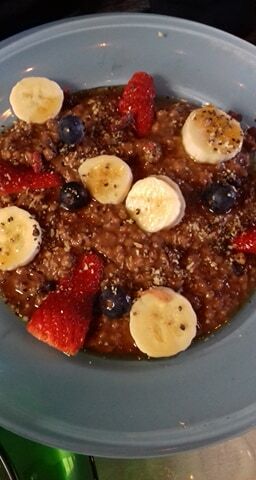 We also ordered the power porridge with cocoa and maple which also was topped with some blueberries and banana. All of the food and drinks we ordered were fantastic, we also got some raw bounty and snickers bars to take home but demolished them off before we got a chance to take a picture. The lady in the restaurant told us that they were in the process of trying to make everything vegan but they kept the vegan and vegetarian foods separate when preparation was being done. 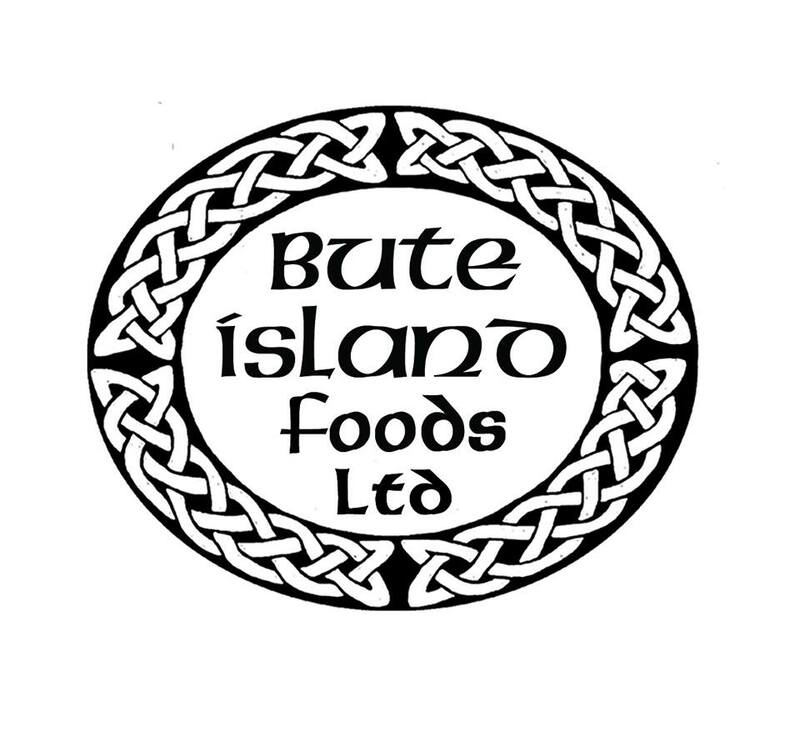 We would definitely recommend a trip to this restaurant and we will definitely be back for some of their beautiful food.